Calculate vinyl siding, trim, and materials needed by entering the dimensions of the building below. You’ll get a detailed bill of materials and cost estimate for your project. Vinyl siding is a beautiful and cost effective material to enhance your home’s curb appeal and exterior look. The first step to a vinyl siding installation is to estimate and order materials. Finding the amount of material needed is a fairly simple process. Vinyl siding is sold by the square, which is equivalent to 100 square feet of material. To find the number of squares, measure the square footage and divide by 100. Start by measuring the height and width of each wall of the building. Multiply each length and height measurement to find the square footage of each wall, then add them together to find the total square footage. Divide the total by 100 to find the number of squares of vinyl siding to order. Estimating the amount of trim needed for your vinyl siding project starts with understanding what trims are available and where they should be installed. From there it is possible to measure all of the areas for trim to calculate the trim needed for the project. The calculator above will also estimate the amount of trim pieces needed based on the number of doors and windows and the size of the project. J-channel is a trim piece that is used to cover the exposed edges on the sides of vinyl siding. This is often used to cover the edges of windows and doors and the top of the wall beneath the soffit. It can also be used for inside corners or where vinyl siding meets another form of siding or trim. Add the measurements of all of these surfaces to find how much J-channel will be needed. Starter strips are used at the bottom of a wall to provide a solid attachment for the bottom of a piece of vinyl siding and to fur out the bottom of the piece for an even look. You’ll typically need this around the bottom of the wall. Measure the walls along the bottom of all the siding to estimate starter strip material. Utility trim, sometimes called undersill trim, is installed on a horizontal surface to cover the exposed top-edge of vinyl siding. This is often installed under window sills and the top of a wall where it meets the soffit. Measure all of the surfaces that will be exposed at the top of a piece of siding to estimate the amount of utility trim needed. 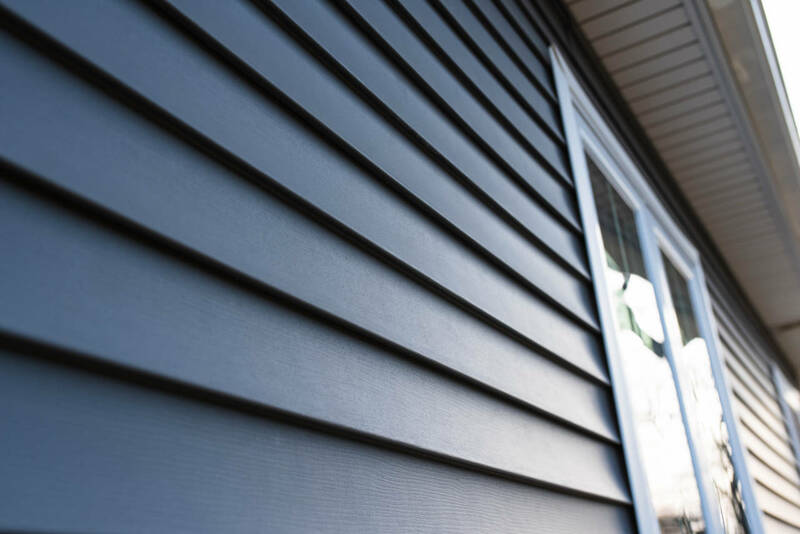 Special trim is available to cover the outer edge of vinyl siding on an outside corner and for siding to meet at an inside corner for a finished look. Measure the height of each outside corner and add together to find the amount of outside corner trim needed and repeat this process for the inside corners. There are several other materials needed for a vinyl siding project. If your home does not have a wrap installed you’ll want to order enough to cover the building. There is special tape available for sealing home wrap for a long-lasting installation. Vinyl siding is installed by nailing it to the building. A nail should be placed about every 12 inches, following the manufacturer’s instructions of course. You will need about 2/3 of a pound of nails per square of siding being installed. Be sure to use a galvanized vinyl siding rated nail to prevent rusting. Plan to order additional material to account for waste. Most contractors recommend ordering an extra about 10% additional material to account for cutoffs, mistakes, and unusable pieces. It’s a good idea to have additional trim on-hand as well. Installing new vinyl siding is easy if you measure correctly and estimate the right amount of material to order. Learn more about the cost of new siding and see how vinyl compares to other options. See our other siding articles and calculators as you prepare for your new installation. Before you start your siding project check out our siding installation resources to estimate and plan your project. How Much Does New Siding Cost in 2019? Learn how much new siding costs and what types of siding are available. Find out what factors affect the cost of new siding the most. Are You Planning a Siding Project? Get hassle-free estimates from local siding professionals and find out how much your project will cost. Calculate the material needed to install board and batten siding. Learn how to layout board and batten siding and how to estimate materials. Estimate the linear feet of siding material needed and find the total number of boards needed. Estimate walls and gables and find the right board exposure and overlap.